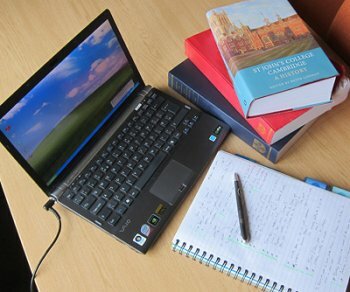 The Learning and Research Fund (L&RF) is available to help both undergraduates and graduate students towards half the costs of the purchase of approved course related books, periodicals, software, hardware, equipment, teaching aid and towards the full costs of approved course related or research related activities such as conferences, workshops, summer schools, summer research programmes, language courses. The maximum sum payable is £300 per year of course for undergraduates (students on full-time courses may claim their entire standard allowance, up to the end of the first three years for which College fees are payable, at any point during those three years), and £500 per year of course for graduate students (MPhil and other one‐year graduate courses may draw on an allowance under the Fund of £500; The maximum allowance for full-time PhD students is £1500 over a ‘standard’ course duration of three years/nine terms, and funds can be drawn at any point during those three years). From 1 October 2018, mortgaging system is allowed, whereby unspent sums from previous years or expected sums from future years may be drawn upon in respect of the total period during which the student expects to be paying fees for the current course. Only students currently in residence are eligible to apply (e.g. students on their year abroad are not eligible to apply - except for travel to and from the place of the year abroad, and offer holders are not eligible to apply for anything purchased before 1 September of the year they commence their course). Applications for funding for books, periodicals, software, equipment or teaching aid may be submitted after the items have been purchased but students might want to ask for prior approval in case there is any doubt. Please be advised that funding is not available for studies which are considered to be a prerequisite of the course you are currently studying. For example, the course English for Academic Purposes cannot be funded by the Learning and Research Fund. Geographers and Geologers can claim for Fieldwork for Compulsory Part II dissertations via the application form for Geographers and Geologers below. Students can claim 100% of expenses up to a maximum of £400. Please log in to the College website on the top right and visit the Student Services page in order to download the form and view the policy.